At Outskirts Press, Inc., we take great pride in celebrating the work of our successful self-publishing authors, and we do so each week through our Self-Publishing Author Spotlight. This week we highlight self-publishing author D.M. Greenwald, who has published three successful titles with Outskirts Press. Learn more about D.M. Greenwald including his love and knowledge of dogs shines in his published works through this week’s Self-Publishing Author Spotlight. D.M. 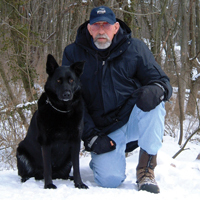 Greenwald has been a professional dog trainer for many years. He lives in western Michigan where he hikes, rides horses and motorcycles, and plays with as many dogs as he can find. Frozen Moon begins at the onset of one of the worst winter storms of the twentieth century, when a little girl has disappeared from the ski lodge where she and her parents are vacationing. The attempt to find her requires a herculean effort involving many people, most notably a remarkable man from Wisconsin and his two extraordinary dogs. Frozen Moon details the entire search-and-rescue ordeal, from its impossible beginning to its unimaginable ending. Above all, this is a heroic story about sacrifice, loss and redemption. Two thousand miles apart and only one day after an exhaustive winter rescue, Joshua Paul Travis and his estranged wife, Kristian, separately recount and relive their romance, their breakup, and the harrowing search-and-rescue operation near Cody, Wyoming that changed their lives. Cody is both a sequel and a prequel to Greenwald’s critically acclaimed novel, Frozen Moon. It is a beautifully crafted and dramatically charged novel that will make you smile, make you cry and, above all, make you turn the page to see what happens next. A child is dead, a second is missing when Joshua Travis and his dog team are asked to help find a Girl Scout stolen in the Wichita Mountains of Oklahoma. But this search-and-rescue operation unfolds like no other. The logistics are difficult and complicated. The terrain is rugged and dangerous. The circumstances are violent and unfathomable. Worst of all, Joshua must sacrifice his cardinal rule against participating in manhunts. His decision to do so will have dramatic and irreversible consequences. The Wichita Mountain Manhunt brings readers a stunning conclusion.